I began scuba diving in 1976 and have been taking underwater photos since 1996. Two of my recent photos have been on the cover of Underwater Speleology. 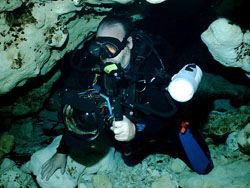 I use a Nikon D-200 camera, a Ikelite housing, 8" dome port, and DS-125 strobe.